The Site has at least 25 points of sale, including at least one medium-sized shop (2,500 sq m and more). There are some exceptions to include all the "significant" Sites that would slightly deviate from these rules. The Site "Saint-Tropez" (shopping street) is a good example. Number of Shops - HOUSE EQUIP. Number of Retailers - HOUSE EQUIP. "Locations" can be "Retail Locations" (Shops, CHR, Services...) or not (Buildings, Monuments, Town Hall...). "Retail locations" can be occupied or not. 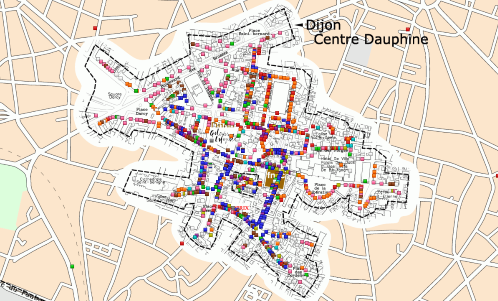 If they are occupied, each retail location will be assigned one or several activities by Codata. If they aren’t occupied, they are classified in 3 subclasses, namely "Empty", "Works" and "Warehouse". Calculation of the occupancy and vacancy rates and of the commercial density. Occupancy rate is the ratio between the number of occupied retail locations and the total number of retail locations. Vacancy rate is the ratio between the number of "empty" locations and the total number of retail locations. The Commercial density corresponds to the number of Retail Locations divided by the total number of Locations.